Pros: Durable, well made, long lasting. Review: This was a mic replacement for an H20-10S headset. They are about $600.00 new. Replacing just the mic for around $50 bucks was well worth it. The clarity is excellent, as usual. Pros: Helpful friendly reps, easy install, fast shipping. Review: Talked to the helpful representatives because my mic was not picking up on my voice. They suggested replacing the mic and told me how to install it. I went flying the next day and my headset worked perfectly. Q: Could this mic be used to replace the P/N 09168P-32 on a David Clark P/N40493G-01 headset? If so, will this microphone allow the headset for use in general aviation aircraft with your adapter (.25" Single Plug to Fixed Wing)? I think some sites have this adapter listed as a PA-92? 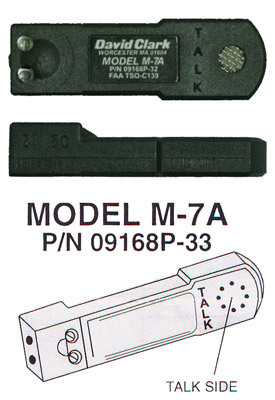 A: This is the same as the 09168P-32. The mic is still stamped with the part number 09168P-32, however David Clark now packages and sells it under the newer 09168P-33 part number. The David Clark 40493G-01 Headset for the C-17 doesn't have a .25" plug. Instead it uses a U/174 plug which is 7.1 mm / 0.281 inches. So, the helicopter to fixed wing adapter should convert the 40493G-01 headset. A: No, the David Clark H8542 Headset requires the David Clark M-2H 150 Ohm Microphone. Q: Will I be able to use this mic with the icom A24 and a PTT switch. If so, will I need any modifications? A: Sure, that would not be a problem at all. The M-7A microphone is standard in some of David Clark's most popular headsets (i.e. the H10-13.4) and works great with the Icom IC-A24 and the Icom PTT switch. Q: Could this mic be used to replace the microphone on the H10-76 and H10-76XL headset for use in general aviation aircraft? A: No, for use on an H10-76 series headset, you would instead want to get the 1142-22 Elecret Mic found here.